In addition to the online availability of “Foulards”, which is the debut e.p by Aim Low, if I understand correctly, a very small edition of nicely covered, hand made physical copies has been issued as well. One of these copies has found its way to my desk, accompanied by a professional information sheet that described the methods used in order to create this album, namely different uses of guitar effects pedals. Aim Low has three members, that I also know. Their names are kept secret, but they do reveal that they are using various guitar loops, as well as bass and vocals. With this information I went on and listened to the album, which turned out to be a really good blend of slow guitars, echoing through endlessly vibrating feedback loops, spanning over two tracks and actually, pretty mesmerizing. Through the muddy, endless ocean of abstract sounds, Aim Low always keeps a bright beacon for the listeners to hang on to. Static formations of sounds, mainly from endless guitar drones or obscure and intense human screams are piercing these clouds of sounds, forming images that can be seen for short times beneath the fog of heavenly heavy haze of feedbacks. Like other improvised compositions, getting into the recording room and making this album happen is a game for the members of this group, who collide sounds together and wait to see what happens as the different waves interact with each other. Playing with cables and pedals, as the members of this group describe, Aim Low enjoy releasing these ghost ships of sound unto this muddy sea, and in front of the listeners, only to sink them several minutes later and make them disappear beneath the endless ocean of sound. 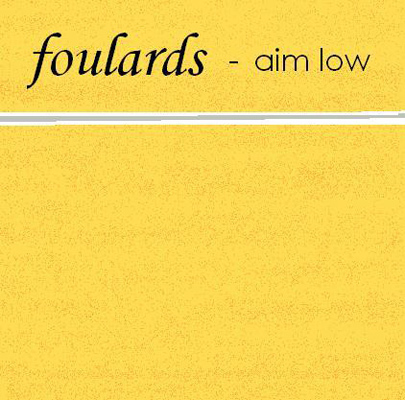 “Foulards” sums itself up as a very interesting and rewarding E.P, documenting great moments of improvisations. The only question that remains is how the next release by Aim Low is going to sound in comparison to this one. I personally hope that Aim Low are going to add another dimension to their music, thus making a progress with their great potential.